Sending out email newsletters is one of the best ways to keep in touch with your customers. Newsletter marketing reminds your clients that you are still there, it keeps them up to date with all your recent promotions and can be used to inform your customer pool of any new services or products that you are offering. Sound easy enough? Well, it is pretty easy, but paying attention to the little details can make all the difference if we want our newsletter to bring maximum results. The content of the newsletter may be what we are trying to market but the design is what will attract the customers and get them to keep reading. Creating a newsletter that is good looking, enticing, and compelling is what you want, or else your customers will start fading away. Luckily for you, here at ActiveTrail, you don’t have to worry about all that. With ActiveTrail’s fantastic email newsletter templates, creating a newsletter couldn’t be any easier! The enormous array of newsletter ideas that are available in our system will meet all your needs, no matter which kind of newsletter you wish to send. You’ll never have to settle for anything less than perfect again! Some email newsletter templates are more visual, based mostly on images and pictures while others are text-oriented and push the recipients’ focus towards the text. Pick whichever design best suits your needs. No matter what your past experience with designing or producing newsletters is, within a few minutes you’ll have mastered the system, it’s as simple as that! Just pick one of the ready templates and start editing it to fit your vision. Creating a newsletter and sending it out is as easy as sending out any email, and if you can do that then you can send out a professional looking newsletter in a matter of minutes. Don’t know which template to pick? The most important factor to consider when picking an email newsletter template is that the design of the template should be focused on conveying your main idea or message in the clearest, most precise and straightforward manner. So before picking a template, make sure you have a clear main idea that you want to pass along to your clients via the newsletter. If your main idea is a visual one that you would like to present to your customers using pictures or some kind of a sketch, then you need a newsletter template that is focused around an image. These kinds of templates focus the customers’ attention right to the image, pushing the text aside, therefore the image must be prominent in order to grab their attention. If text is the most important part of your newsletter, you need a different template altogether. A template that focuses your recipients’ attention on the text and away from the images will keep them reading and images should not distract them if they are not the main exhibit. Check out our various examples on our website to see what a newsletter should look like. 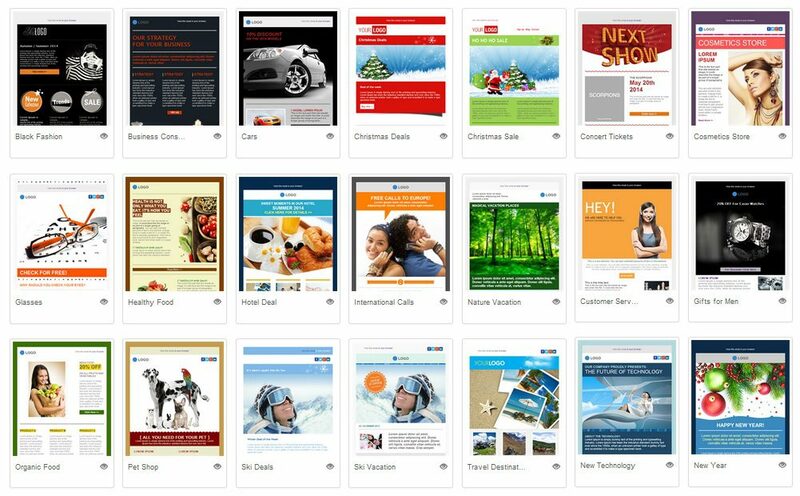 Get inspired by looking at ready newsletters and templates that we know from experience, can get the job done. Empty templates – This type of template is for users who know HTML and can build and design their own templates to their liking. Simple templates – Build your own template from scratch but with no HTML skills needed. This type of template is more modular and will fit any need but requires more work. Title and article templates – This template comes with a title, subtitle, main text, an image and an article. Nothing is fixed and changes can, of course, be made to the template. Two article templates – As is implied by the name, this template allows for two main articles or two images. A main title and subtitle are also included. Two product templates – This template allows you to display two different products, using text, images or any other visual tool. All of our templates are modular and anything can be modified in any way you like. Pick an existing template of any kind and fit it to your needs with our easy to use system, which you will have mastered in mere minutes. Join ActiveTrail to start designing your first newsletter right away!